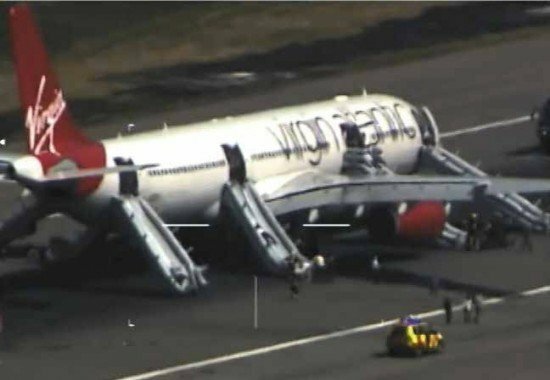 An AAIB report on an April 2012 emergency involving a Virgin Atlantic Airways Airbus A330-300 (G-VSXY) showed that smoke warning from the cargo hold were spurious. The aircraft was operating a flight from London Gatwick Airport to Orlando-McCoy International Airport, USA with 13 crew members and 304 passengers on board. Early in the flight the crew received a series of smoke warnings from the aft cargo hold and the commander elected to return to London Gatwick. The crew carried out the appropriate emergency drills, including the discharge of the fire extinguishers in the aft cargo hold, but the smoke warnings continued. The aircraft landed safely, the crew brought it to a halt on the runway and endeavoured to establish the extent of any fire. This produced conflicting evidence and, with smoke warnings continuing, the commander ordered an emergency evacuation. The passengers all left the aircraft within 90 seconds but two injuries, classed as serious, were incurred. Subsequent examination of the aircraft and its systems showed that the smoke warnings had been spurious. The investigation identified that injuries were sustained during the evacuation of the aircraft. The evacuation was initiated based on the commander’s assessment of the available sources of information, including the repetitive and intermittent nature of the aft cargo smoke warnings. i) A latent fault on the T1 thermistor channel of smoke detector 10WH, in combination with a CAN Bus fault and possible high levels of humidity in the cargo compartment due to the carriage of perishable goods, provided circumstances sufficient to generate multiple spurious aft cargo compartment smoke warnings.